I interviewed two candidates for my alma mater, Brandeis University, on the same day. I met the first interviewee at Barnes and Noble. I waited expectantly, eyeing each 17-year old who entered trying to guess if it was my prospective student. He arrived and we found a table at the café. I could tell he was nervous, so I tried to ease him into the conversation. We spoke about his high school experience, his activities and what type of college experience he was seeking. Then I got to the question I ask all interviewees: Why Brandeis? He had a pat answer, he liked that it was a liberal arts college in Boston. So I probed a little, “Why do you think you would be a good fit for the school?” He stared back at me with a blank expression, uncertain of the answer. Later that afternoon, I interviewed another prospective student. This time we met at Starbucks. We met in the parking lot as we both arrived for the interview. She was dressed professionally and greeted me with confidence. As we chatted on our way inside and found a table, she immediately engaged with me about how much she liked Brandeis when she visited. She then handed me a resume listing her activities in case I wanted to reference it. (I always appreciate when students hand me a resume because it makes it much easier when I later write up the report.) As we chatted about her experience in high school, her activities, and her college search, I came to the question: “Why Brandeis?” This student was able to tell me in a very specific way why she was a good fit for the school. She talked about its strength in neuroscience, its excellent pre-med program and most importantly, said she felt very comfortable with the openness and friendliness of the student body. She spoke about her experience with great excitement and as she described all the things she liked about Brandeis, I could see her fitting in and making her mark there. 1. Dress professionally, but with your own sense of style. One of my clients designed and made jewelry as a hobby. I suggested she wear a piece during the interview to serve as a talking point. She later told me excitedly that, in the interview, they spent a lot of time talking about her jewelry and it was great to have a piece on hand to demonstrate her true passion for creation and design. Since she was a math/science student, she was able to show a different, more creative side of her personality. 2. Research the school. While not all students can visit a campus before applying (although I highly recommend it if you can), you can still research the school online, speak with current students, and attend an information session at your high school or locally. If a student I'm interviewing tells me she wants to major in Engineering, I know she has not done her research because Brandeis does not offer engineering. However, if she tells me she wants to do a 3+2 dual degree program with Brandeis and the Olin School of Engineering, then I know she understands the school. 3. Understand why you are a good match for the school. The first student lost me when he couldn’t make the match, whereas the second one impressed me with her obvious passion for, and fit with, the school. 4. Bring a resume. An alumni interviewer’s job is to report back to the college whether a particular student might be a good fit for the school and what he or she will bring to the community. 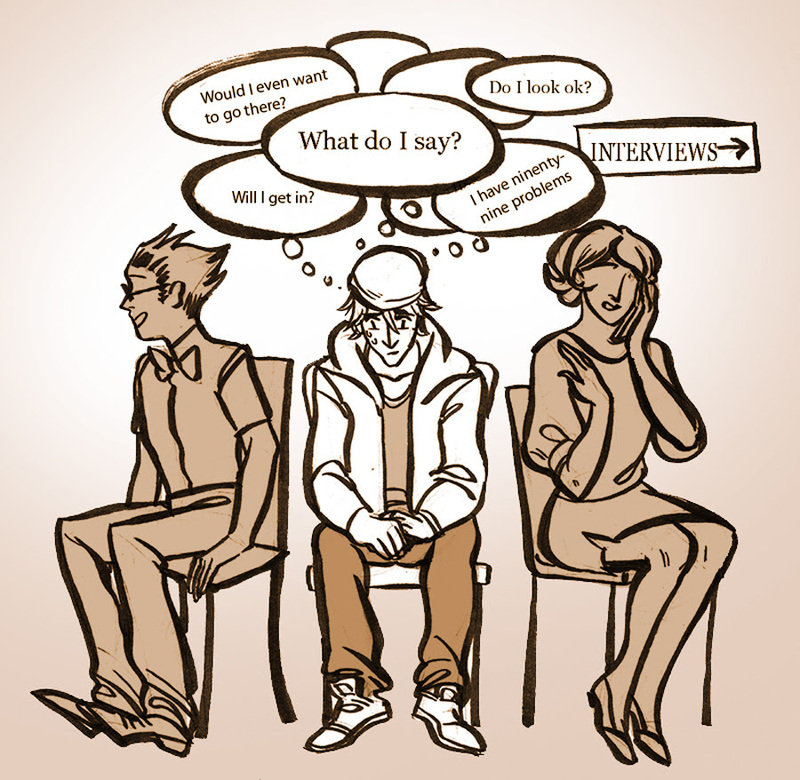 This is easier when the interviewer has a written record of the applicant's background. Some interviewers may not want one, but it’s good to be prepared. 5. Be yourself. Interviews can be intimidating, but remember, this is a conversation. If I find a student can engage me in an interesting way and show his/her personality, I am impressed. I want to understand what makes a student unique. I met one student who was extremely down-to-earth, a bit nerdy, and proud of it. She was unapologetically interested in learning; I could tell that her intellect was keen and that she would contribute in a considerable way to the academic life of the school. 6. Finally, make eye contact and shake the interviewer’s hand firmly (just don’t break it!). Good luck with your interviews. To How Many Colleges Should a Person Apply? I was talking to a high school senior last April who told me he had applied to 17 colleges and universities. I told him if he had consulted with me, I would have advised him that 17 is far too many. I then asked him, "Who let you do that?!" He admitted that others had advised him to trim his list, but he did not listen to them. Part of “Adam’s” rationale was that the schools to which he was applying had very low admission rates (including all 8 Ivies), and, given the “lottery-like" nature of getting in to those schools, he’d have a better chance if he bought more lottery tickets. His goal was to get into an Ivy League school, not to pick a college that would be right for him. In addition, he was rejected by the school to which he had applied Early Decision, an experience that left him feeling vulnerable and unsure of his chances of being admitted to other similar schools. Adam claimed that, after completing the first five applications, the rest were easy, to which his good friend standing nearby interjected, “No, it wasn't. Don’t you remember?! You were going crazy right before the deadline. You were really stressed out.” Not to mention that his parents shelled out about $1,300 in application fees. His decision took a very large financial and emotional toll on him and his family. In the end, Adam was rejected by 14 schools and admitted to three: his state university, another nearby state university, and one of the Ivies. Deep down, he was disappointed by the outcome, but felt he could not express that to others since, after all, he'd accomplished his goal of being admitted to an Ivy League school (though not the one he actually liked). I do not recommend Adam's philosophy or strategy. Students should think hard about which colleges will give them what they want, need and deserve. Where will they thrive? This is not about what sticker your Mother puts on her car or some misguided competition with your friends. It is about being in a place for four years where you will grow the most academically, socially, and personally. Five to eight target schools is sufficient if they are carefully chosen. 1-3 "reach" schools, 2-3 "on-target" schools and 1-3"very likely" schools. And, for heaven's sake, don't apply to School X if you wouldn't go there if admitted. As a client recently told me, "If I only get into X, I'll probably take a gap year and reapply." We eliminated School X from his list. It’s October already. You may recall my cautions about how fast Thanksgiving arrives for high school seniors. With that looms the Early Decision (ED) and Early Action (EA) deadlines. 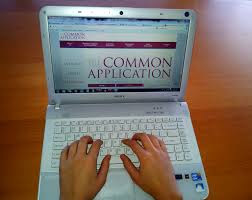 Perhaps the most feared aspect of applying to college these days is writing that big Common Application essay, along with similarly sized supplemental essays that colleges love to attach to the Common App. For some students, major essay writing can be completely intimidating. It doesn’t have to be that way, though. By now in your educational experience, you should have enough writing acumen to at least approach these writing challenges with a reasonable group of skills. You’ve been writing papers and reports for a number of years now. Application essays are essentially a combination of technical expertise and imagination. Humor can be a big help, too. I’ve made a number of posts over the years here about essays — approaching them, conjuring ideas, infusing using humor, etc. I’ll continue today with more ideas, trying to help those of you who are beginning or continuing to develop your Common Application and supplemental essay efforts. Over the next several posts, I’ll share with you some real-world essay examples that I have gathered from past years as I have counseled seniors on their college quest. I’m a believer that seeing what works for others is an excellent way to expand your thinking and quell those fears. I had reasonable success in my young years as a tennis player. I never had a professional lesson. What I did do, however, was attend a lot of tennis tournaments, watch tennis on TV, and buy how-to tennis books written by the pros. By observing what worked for all these players who were better (far better) than I was, I lifted my skills and became a more competitive player. That’s the approach I would like to take here: observe and learn. So, let’s give it a try. Meet Jim Haggerty. He’s a young man from New York whom everyone should know. I feel this way even though I’ve never met him. That’s one of the downsides to communicating only by email. I don’t get to meet “my kids” and their families in person. Nevertheless, Jim’s superb essay speaks quite clearly and provides a prime example of how applicants can project a lot about themselves to the admissions staff without ever appearing in the flesh to state their case. Jim’s essay is a good example of how a longer essay can hold the reader’s interest. One crucial mistake some applicants make is to equate length with significance. One past year, Princeton’s prompt included a reminder about the brevity of President Lincoln’s Gettysburg Address (a mere 272 words). The point to note is that if you have something interesting to say, then by all means say it, but don’t drone on in hopes that eventually something good will occur (it almost always doesn’t). The theater changed my life in fourth grade. When I delivered my line, I was the center of the world for five seconds. It was a wonderful feeling, only one that an actor could know. I was going to be an actor and nothing could stop me. Five minutes later when the director cut my line, I quickly changed my mind. I did not become involved in theater again until ninth grade when I joined Stage Crew to please an English teacher. While my report card might have been the initial catalyst for participating, I fell madly in love with my screw gun and a year later I was Crew Chief. There was a great satisfaction in building scenery, an overwhelming sense of pride. That year I helped build rotating boxes for My Favorite Year. The boxes would rotate to reveal a new scene on each side. Unfortunately, the boxes were so big, they crushed the wheels that supported them. Poor designing or not, I still loved every minute of it. But the Stage Crew got to do even more; we moved scenery. Moving scenery was absolutely insane. With my heart pumping and adrenaline rushing, I ran frantically around the stage pushing couches and turning boxes. I had fun. Lots of it in fact. So much that I kept doing it through productions of The Crucible, The Me Nobody Knows, and West Side Story, just to name a few. This past summer I joined the Scarsdale Summer Music Theater’s performance of Pippin to improve my growing backstage skills. I found myself Crew Chief, Stage Left with two main responsibilities. First there was the fly rail, the metal bar that handled all of the flies, the scenery that dropped from the ceiling during the show. You controlled the flies through a series of ropes and brakes. Pull the rope one way, the scenery would drop. Pull it the other way, the scenery would go up. If the fly ascended or descended too quickly, you applied a brake to the rope. It was simple enough, but mistakes with the flies could lead to seriously damaged actors. The flies made me nervous. I was also responsible for a crew of five people who had to execute fifty-six separate cues, many of which happened in complete darkness, and one right after another. If we succeeded, the audience wouldn’t even notice our presence. But an error could throw off the pace of the show, or even worse, bring it to a screaming halt. That made me more nervous. The first two shows were not exactly masterpieces. Opening night was our first run through and was filled with glitches. The second night wasn’t much better. I was determined that the third show would be perfect. I also wished I had a bottle of Pepto-Bismol. Lacking that, I swallowed my fear and began screaming orders. Cat, one of my crew members, was making fun of my attempts to be an authority figure by doing an impression of me. I scolded her in just the manner that she had been making fun of. I shook my head and put on my headset. Nikky, the stage manager told us to get ready. The first act was almost over and all I had to do was lower a pair of arches from the ceiling that would magically transform the stage into a cathedral. Nikky called the cue and I began lowering the arches. I had begun to ease into a state of relaxation when Nikky suddenly started yelling “Hold!” into my headset. The arches had just crashed into a platform on the stage two inches away from the actor playing Charlemagne. I quickly raised them so the Stage Right Crew could move the platform, and lowered them when the platform was clear. I had a horrible sinking feeling in the pit of my stomach. I had visions of the director cutting me from the show and sending me home. I really could have used some Pepto-Bismol. I felt lousy for the rest of the show. I had messed up big time and almost killed Charlemagne. But I still barked orders, made funny hand signals, and kept the crew going despite a growing void in my stomach. I wanted to stop, but this show was the culmination of a month and a half of work, including many twelve-hour days. But I had messed up, which bothered me. As the show ended, I wanted to make a quick exit for myself, when I saw Nikky coming up to me. “You’re the man,” said Nikky with a big smile. There were more compliments in that smile than in a standing ovation by four thousand people. The mistake faded away as a distant memory. For five seconds, my pride swelled enough to make me feel like the center of the world. It was the most wonderful feeling I’ve ever had, only one that a stage hand could know. He first got the idea to use humor in his writing after reading (on his own) Voltaire’s Candideearly in high school. He fancies himself as a science and math type, but his writing has always been one of his strongest points. Once again, we see the element of balance as a defining characteristic. Jim’s sophomore English teacher inferred this balance by noting on one of Jim’s poems: “Not bad for a computer nerd.” Indeed. Jim’s essay works on many subtle levels. The interesting thing about good writers is that sometimes they’re not aware of the intricacies they create when they write. They just write. We can learn a lot from this essay. It’s a terrific object lesson in how to do it right. Here’s a partial analysis with some supporting information thrown in. The incident in the first paragraph of Jim’s essay is a true anecdote. He had one solo line in the play, and was enjoying being “an actor” (even with one lonely line) when the director cut it. Don’t forget your “formative” memories. The events of our youth — sometimes inspiring, sometimes traumatic — can prove to be wonderful starting points for an essay. Obviously, the nature of the event will set the tone for your statement. If you’ve decided to take the serious path in your essay, don’t be afraid to reach deep and pull out your remembered emotions that event inspired. Chances are, your readers may have experienced something similar and your candidness might inspire their empathy. If, like Jim, you choose a lighter approach, your predicament should prove to be an excellent foil for your humorous touch. Once again, we can see how reading plays a role in successful essays. According to his father, Jim is a “voracious” reader who likes to hang out at more at Barnes & Noble than the mall. He doesn’t take himself too seriously, a quality that seems to come through in his essay. Jim is undecided on a college major, but is leaning toward the natural sciences, computer science, or perhaps engineering. English is definitely out, though, (“too many serious and deep people”). Many times, there is a connection between writing skills and an interest in engineering. This refutes the stereotype that technically oriented types tend to be poor communicators (re: “Not bad for a computer nerd”). Jim’s profile supports the “poet-scientist” hook. He assembles computers in his spare time and is looking to overthrow Microsoft someday, a true off-the-beaten-path, if not highly idealistic, attitude. His “balance” aspect is further supported by his ECs. He participates in the high school band, theater, literary magazine, and Boy Scouts. Jim likes science fiction, has an excellent collection of comic books going back to the second grade, admires Being Digital by Negroponte, and has warehoused his childhood collection of Transformers (another engineering seedbed). Also note how Jim’s subtle humor sets the stage, so to speak, in his opening paragraph. After a great personal-revelation lead, “The theater changed my life in fourth grade,” Jim needs only four sentences to set us up and then pull the rug from under us. He goes from his one-line “center of the world” to a complete change of mind. We’re compelled to keep reading. This is what lead paragraphs are meant to do. Close the loop. Bring your essay full circle. Notice Jim’s third sentence in his opening paragraph: “It was a wonderful feeling, only one that an actor could know.” Now skip all the way to his final sentence, much later: “It was the most wonderful feeling I’ve ever had, only one that a stage hand could know.” That’s closure, baby! Jim started out being enthralled by acting. Then he experienced one of life’s little curve balls. He adjusted, making the most of his situation. He found success and happiness as a stagehand, which is not a glory role but challenging enough, as we see from his technical description of the goings on backstage. Jim lays out the whole fresco of his evolution from an aspiring one-line actor to that of a dedicated virtuoso Crew Chief (and part-time Charlemagne maimer) between these two sentences. If we’re sharp enough, we pick up the circle and the closure. As a result, we’re satisfied. The tale has been told and is complete. Bravo. Jim provides just one excellent example of how to approach application essays. Granted, most essay prompt guidelines limit word length to fewer words than Jim used. The Common App allows up to 650. However, the point here is to see how personal (and personable) voice and humor, mixed in among pertinent anecdotes can be completely effective in getting your readers to get a feel for who you are.